For tourists, both from out of town and the locals, this map will lead you to a handful of spots used in the making of Michael Jackson’s horror themed “Thriller” music video, to key locations that figured into his death, along with a few points of interest in between (and feel free to leave a comment if there are any places we should add). 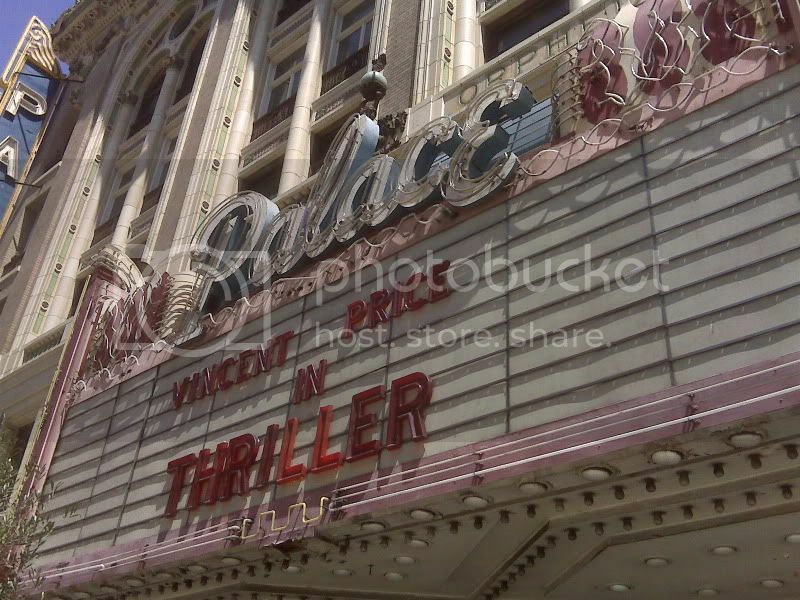 In the days after Michael Jackson died, the marquee once again read, “Vincent Price in Thriller,” in a nod of respect to the legendary music video. (click here for pic) This is the theatre where Michael and his date, played by Ola Ray, are watching the werewolf movie starring Michael. The nearly 100 year old theatre is now open only for the occasional special event or film shoot. A bit more on the Palace’s history and trivia at Cinema Treasures. After skipping past the graveyard, Ola Ray turns to find that Michael’s been turned into a zombie. Which, of course, means only one thing: dance off! Fittingly, most Angelenos wouldn’t be caught dead wandering around this intersection at night… but undead? Seems like a nice place to haunt. The actual house is one of more than a dozen vintage Victorian homes in L.A.’s Angelino Heights neighborhood – also known as the Haunted House District of L.A. Even on the brightest summer day the almost every home along Carroll Street appears to be home to any number of ghosts or witches. (take a gander at CreepyLA’s field report of Angelino Heights). At an estimated cost of $700,000, the “Thriller” album was recorded here in Studio A throughout most of 1982. Fact: Songwriter Rod Temperton originally called the title track, “Starlight,” but woke up with a vision of the word “Thriller” at the top of Billboard’s charts. Telegraph has a great behind the scenes article on the making of the album. Unveiled in 1984, MJ’s Walk of Fame star is located mere steps away from the hand and footprints in front of Grauman’s Chinese Theatre, where, among the costumed characters and celebrity impersonators is usually one, sometime two, Michael Jackson impersonators. Also a few dozen feet away is the newly opened Madame Tussauds Hollywood, which for some reason is the only Tussauds in the world without a Jackson wax figure. At the northeast corner of one of the world’s most famous intersections, Sunset and Vine, is this star to the artists formerly known as “The Jackson 5.” In 1975, the group signed with CBS Records after being offered a 20% royalty rate, versus their previous label Motown’s 2.8% royalty rate, but the lost the name as Motown owned The Jackson 5 trademark. If visiting the area, don’t be confused by another Michael Jackson across the street – that one is for an unrelated radio personality. Michael Jackson began renting this home in January, 2009, at a reported cost of $100,000 per month. The LA Times described it as a French chateau with “seven bedrooms, 13 bathrooms, 12 fireplaces and a theater.” (read more about the estate here). On the morning of June 25th, 2009, Jackson’s personal physician, Dr. Conrad Murray, reportedly discovered Jackson unconcious, not breathing, and with a weak pulse, and began to adminster CPR. 30 minutes later, he had someone dial 911. By the time paramedics arrived, Michael Jackson was dead. Even before network news had been able to verify his death, thousands of fans converged upon the UCLA campus when word spread that he’d arrived here in critical condition, when, in fact, he’d actually passed away before the ambulance arrived at his Holmby Hills home. Regardless, medical staff attempted to revive him, and it took hours before the public received official word of The King of Pop’s death. From UCLA, Jackson’s body was brought the LA County Coroner’s office for an autoposy, the results of which have yet to be disclosed, perhaps as the cause of death is still investigated. While Jackson’s body was released to the family a couple days later, the coroner held onto a piece of his brain for further study, long past the day of his funeral (the matter has since been returned to the family). Surprisingly, the Coroners office welcomes visits… to its gift shop, Skeletons in the Closet, where you can find assorted apparel and souveniers (including toe tags) the coroners logo. Michael Jackson’s remains rest within the Holly Terrace Mausoleum here, which is closed to the public. This piece wouldn’t be complete without reports of Michael thrilling from beyond the grave. In a 2013 interview, sister LaToya said that security guards had reported hearing sounds of tap dancing coming from Michael’s room in his former Encino home. Adding to this, she says she feels his presence there. “It’s the strangest thing because you feel something like thick around you or behind you and you’re wondering—you don’t see anything, but you feel a presence,” LaToya said. Want more Michael Jackson? Check out Discover LA’s (less morbid) guide to other spots significant to his HIStory! An earlier version of this post was made on August 6, 2009.